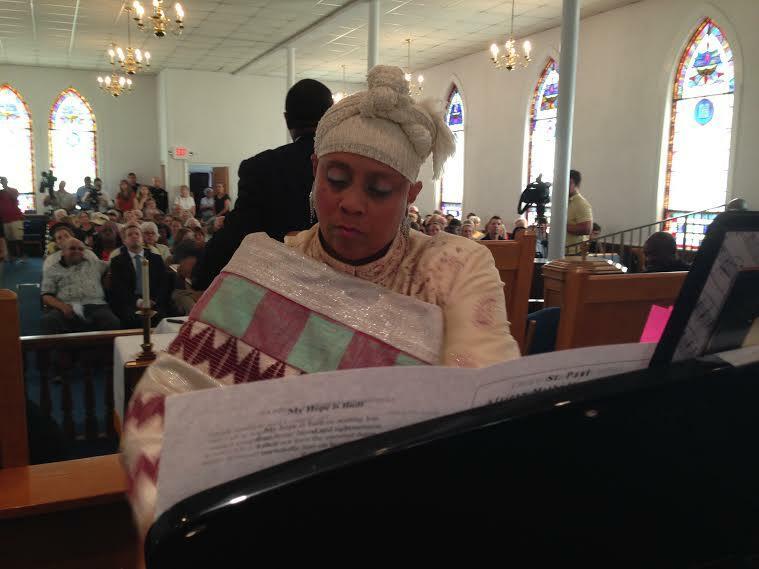 Deborah Woodward played music throughout the prayer vigil at St. Paul AME Church in Chapel Hill. Hundreds of people of multiple colors and creeds filled St. Paul AME Church in Chapel Hill Friday. It was a vigil to remember the slain members of Emanuel African Methodist Episcopal Church in Charleston, South Carolina. Thomas Nixon is the pastor of St. Paul AME Church. He said it was hard wiping away tears and presiding over the vigil. Clementa Pinckney, a reverend and South Carolina senator, was a personal friend to Nixon. Pinckney was shot and killed along with eight others Wednesday night. But Nixon said despite the massacre this week, the doors to his church will not be closed. Leoneda Inge reports on a prayer vigil at St. Paul AME Church in Chapel Hill, remembering the victims of the Emanuel AME Church massacre. “We cannot allow this senseless act of violence to cause us to hide behind padlocked doors, that’s not who we are," said Nixon. Nixon said his church, and others should be like a hospital, and never turn anyone away. Nevertheless, the pastor of the 151-year-old St. Paul AME, said he is aware that what happened in Charleston could happen in Chapel Hill. Rev. Lisa Fishbeck of Episcopal Church of the Advocate, reminded the Chapel Hill crowd that the community was filled with "hearts that are torn, yet again." Fishbeck was referring to when three Muslim students in Chapel Hill were shot and killed four months ago in what many people saw as a hate crime. Wanda Hunter is Co-chair of the group Organizing Against Racism North Carolina. She received a standing ovation after her remarks at the vigil saying, "Black people are tired! White people, are you tired?" Hunter, who is white, said after the vigil, today's gathering was meaningful and powerful. "I think when tragedy like this occurs, we're all reeling, we're all hurting we're all looking for meaning. And it's really important for us as a community to come together to sort of grapple with what's happened, what we make of it and how we go forward," said Hunter. Members of St. Paul AME read the names of the nine people, ranging from 26 to 87-year-old victims, who were killed Wednesday night. They also lit candles in their honor. Several religious and community leaders offered prayer at the event, including UNC Chancellor Carol Folt. A gunman shot and killed nine people at the Emanuel African Methodist Episcopal Church in Charleston, South Carolina, on Wednesday evening. Police arrested a 21-year-old white man from Lexington, South Carolina, Dylann Roof. Host Frank Stasio talks about the latest with NPR correspondent Debbie Elliott.